In a new study on word-of-mouth marketing, some of the highest-scoring TV advertising brands are all about eating. Seven of the top 10 most talked-about brands, based on its TV advertising, are food and restaurant related, according to a new study from word-of-mouth researcher Keller Fay Group. 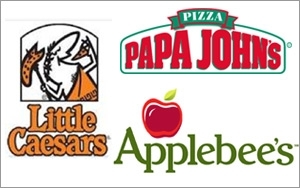 The top three brands based on TV advertising are Papa John’s, Little Caesars and Applebee’s. Also on the list are Red Lobster (fifth place), Olive Garden (8th place), Jack in the Box (7th) and KFC (10th). Other top TV advertisers to score in the 10 ten word-of-mouth metrics are AXE (4th place), Head & Shoulders (6th) and Lexus (9th). With regard to specifics around Papa John, the pizza-based company, one-third of its positive conversations included a discussion of its TV ads. It also said that NFL player Peyton Manning and Papa John’s chief executive officer who appeared in commercials fostered conversations. Keller Fay Group has partnered with Analytic Partners to gain an understanding of consumer word-of-mouth marketing and brand advertising. It will combine tracking data from Keller Fay’s TalkTrack service, and Analytic Partners’ ROI Genome Project. The company analyzed more than 250 TV campaigns, and says that 13% of all sales -- $6 billion -- are driven by word of mouth. 1 comment about "Fast Food, Restaurants Top TV Ad Brands For WOM Marketing". bill sherman from foodmix, November 3, 2015 at 3:22 p.m. This is a great statistic, but to use it, I need to better understand it. Could you explain: Seven of the top 10 most talked-about brands, based on its TV advertising?